Different types of braiding threads give different effects to your finished hair braid. It can be fun to experiment with different threads and see what the resulting hair wrap looks like. Most people try making their first hair wraps with embroidery thread. Embroidery thread has the advantage of being cheap and easy to get hold of. You might have some already. It usually comes in small skeins, so it isn't too expensive to buy a few different colours, and the colour range is huge. The better brands wash and last well. However embroidery thread isn't the easiest thread to use for hair braiding, and it doesn't give the best finish. Because it is made to be split into separate strands for embroidery, the thread tends to flatten, and it's hard to keep each thin strand at the right tension, so the braid can look a bit uneven. Pearl cotton thread is similar to embroidery thread, but doesn't split into strands. It comes in different thicknesses, No.3, No.5, No.8 and No.12. No.5 is the best braiding thread, and comes in lots of colours including multicolour and metallic finishes. You can buy pearl cotton threads in 5 gram skeins, and the price is similar to the better quality embroidery threads. It isn't always easy to find, and you may have to order it on the Internet. Another kind of thread that works well is crochet cotton. Crochet cotton comes in different thicknesses. Stick with one thickness in a braid - it's harder if you mix them. Look for thicker crochet cottons such as No 5 rather than the very thin ones. 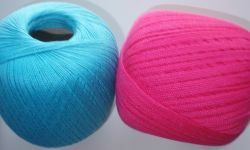 The disadvantages of using crochet cotton for braiding are that it often comes in a limited range of colours and on large balls - so it's expensive to buy a good range of colours. However, if you have some around already it will work well. Glitter threads are fun to use for hair wrapping. 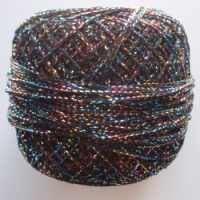 Look for glitter threads which are similar in thickness to the other braiding threads. You can use only glitter threads in a braid, but it is easier to use a mixture of glitter and plain threads, and the glitter threads show up best against the plain threads too. You can often buy glitter threads in small balls. It is possible to use knitting wool (called yarn in the US) as a braiding thread. You can use a yarn which changes colour to make a simple wrapped braid without patterns. 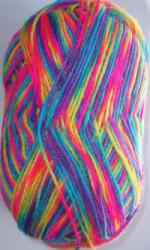 4 ply (sportweight) or double knitting (worsted) acrylic yarns work well used like this. If you want to use yarn instead of pearl cotton or embroidery thread to make braid patterns, look for a 4 ply (sportweight) yarn. Mercerised cotton yarn works well as it isn't fluffy, but you could experiment with others.